One hundred years ago, speakeasies were the place to get drinks and have a good time with your friends. Even though alcohol is legal today, the 1920s are fondly remembered as a time of jazz, flappers, great cocktails and gangsters. 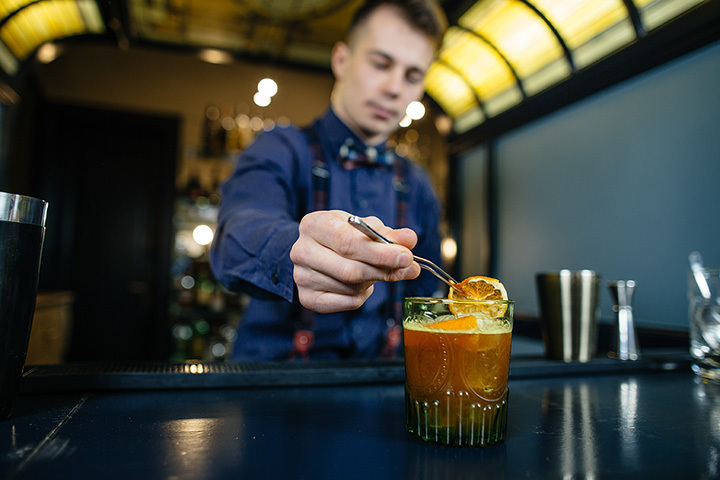 Come out to one of these great Oklahoma speakeasies and enjoy a drink. Bull in the Alley bills itself as a steakhouse and speakeasy. The staff is professional, their cocktails are both creative and classic, and their steak is top-notch. This secretive spot is sure to impress! MixCo is one of the best bars in the state. It calls itself a modern speakeasy. If you’re in downtown Tulsa, you’ll want to stop in for one of their crafted cocktails. The Atreides Mule is highly recommended, but they offer many classic drinks made with high-quality liquor and craft-made mixers. This Oklahoma City speakeasy offers classic drinks like Bee’s Knees, Negroni, and an Old Fashioned, as well as few updated favorites. From 4 p.m. to 7 p.m. daily, during Happy Hour, appetizers are half-priced. Gatsby is a great place for that 1920s feel. The bar specializes in 1920s cocktails, reminiscent of Gatsby himself, but they also have an extensive collection of wine and beers. This bar takes its name from men who smuggled alcoholic beverages, also known as rum-runners. It’s not so much the ritzy version of a 1920s-era bar, but more of a local hangout where the drinks are strong, the atmosphere is intimate, and the food is excellent!